Today’s Airfare of the Day goes to Lufthansa and Swiss and their 2nd level business class excursion fares between Rome and Singapore. Price: from 1,517€ (949€ base fare + taxes & surcharges). Flight restrictions: do not apply. Minimum stay requirements: 6 days or until first Sunday after departure. Travel restrictions: valid for travel commencing on/after 21DEC 18 and on/before 31MAR 19. Changes: charge 250.00€ for reissue/revalidation. 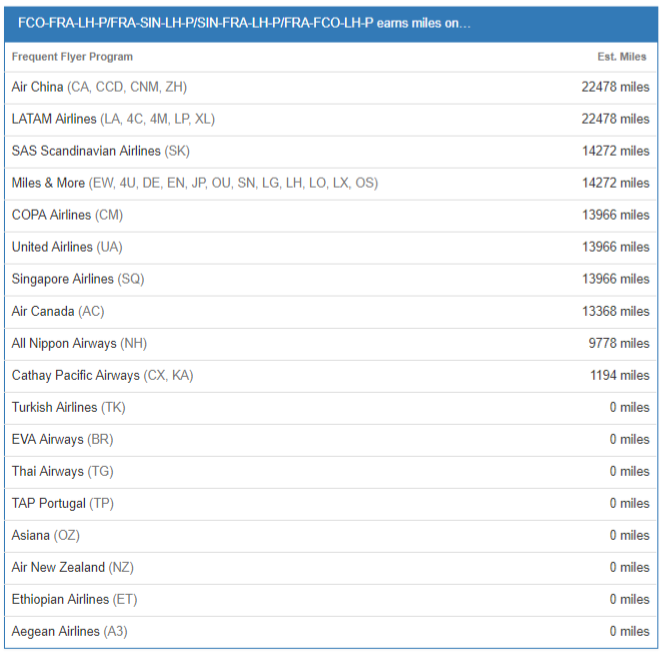 The following accruals were estimated using wheretocredit calculator for FCO-FRA-SIN round trip travel on UL marketed and operated flights without considering any elite status bonuses or ongoing promotions.